The Singles’ Day shopping bonanza means also over one billion packages flying across the globe. Millions of packages add up to tonnes of cardboard, plastic, tape and bubble wrap. Along with impressive sales figures, Singles’ Day has also become to signify a huge amount of waste. Last year Singles’ Day sales resulted in an estimated 300 000 tonnes of unrecycled packaging waste in China. Recently many have started to voice concern over the impact of the one-day shopping spree on the environment. One of those uneasy about the blatant commercialism is the author and journalist Lijia Zhang. 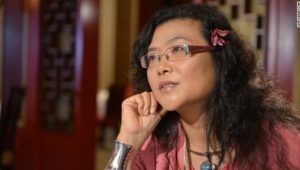 Zhang Lijia is a speaker at the China Speakers Bureau. Are you interested in having her as a speaker? Do get in touch or fill in our speakers’ request form.